Senior leaders of Jatiya Oikya Front (JOF) are going to Sylhet on Monday to visit violence-hit Balaganj upazila where a Jatiyatabadi Chhatra Dal (JCD) leader was gunned down by criminals during voting December 30. 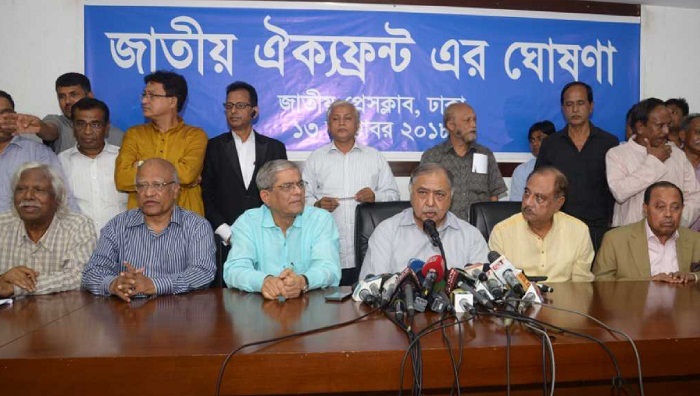 A five-member Oikya Front delegation, led by BNP secretary general Mirza Fakhrul Islam Alamgir, is scheduled to reach Sylhet around 10:45am by air, BNP chairperson’s media wing member Sayrul Kabir Khan told journalist on Sunday, reports UNB. Sylhet district BNP office secretary M Fakhrul Islam said the Oikya Front leaders will first offer fateha at the shrines of Hazrat Shahjalal (R) and Hazrat Shahjalal (R). The Oikya Front leaders will also visit some election violence-hit areas in the upazila before returning to Dhaka.